Window coverings aren't just for privacy anymore. And cordless solar shades prove that, especially with all their benefits, customizable options, and style possibilities. Not only do they look great, but they also offer a lot of benefits. Both the interior and exterior window shades are modern and functional. What more could you ask for? Blocking up to 95% of harmful UV rays, they will keep your family healthy and strong, and keep your furniture from fading or being damaged by direct sunlight. Solar roller shades help increase your home’s energy efficiency by keeping your home cooler in the summer and warmer in the winter. They provide an extra level of insulation to your windows, so you can have a comfortable home, no matter the season. Because sun screens for windows increase your home’s energy efficiency, they also help to decrease energy costs. Ultimately, they help you save money and use less energy. They're also perfect for media rooms, offices, and home theaters because they eliminate glare on televisions, computer screens, and phones. Depending on the exact shade you choose, you can keep them drawn and still see outside. With solar blinds, you don’t have to give up your view in order to reduce glare, block UV rays, and decrease your energy costs. You can have it all. 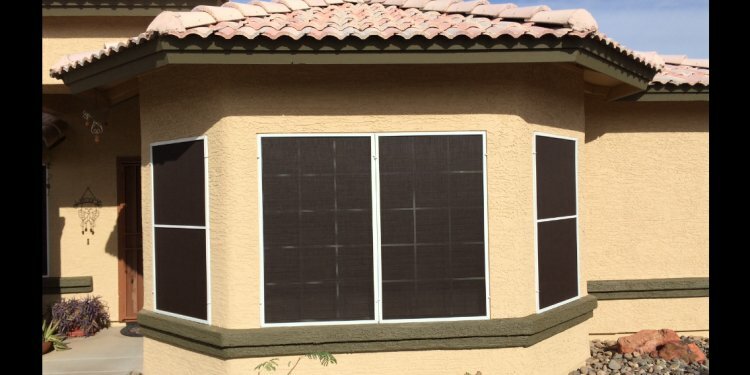 Solar screens are easily customizable, so take a look at all our options and features. With our solar shades, we eliminate the cord altogether. Cordless is the ultimate child-safe option, and it will give your home a streamlined, clean look. Motorized shades mean modern convenience. Control them from anywhere in your home with a small remote. It’s easy-to-use and convenient, so it makes them perfect for those with physical limitations who would like some more independence. Need your order right away? Select sunshades are made and shipped in three days or less. Ordering doesn’t have to be a long process. Get them when you need them. It’s as easy as that. Cordless solar shades may be modern, but they’re also timeless. They’re sleek and clean, and you have a lot of style possibilities. Because they’re moisture and mold-resistant, they're great in bathrooms and kitchens. They’re also perfect for classrooms and bedrooms.